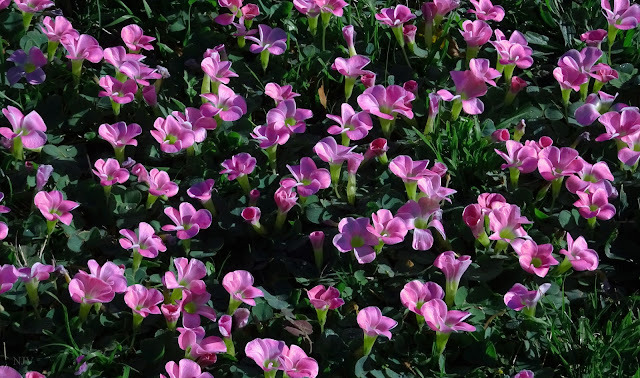 Oxalis purpurea is a summer-deciduous, winter-growing dwarf geophyte seldom higher than 6 or 7 cm, in the Oxalidaceae family. It forms a small rosette or mound up to 20 cm in diameter of trifoliate (clover-like) leaves which are dark green and not visibly hairy. It is unique amongst dicotyledonous plants in that it forms true bulbs which are often buried deep underground. Each bulb produces a single thin underground stem which gives rise to the above-ground rosette. The bulbs readily proliferate by producing smaller bulbils, each also producing a single stem, often resulting in a posy of plants and flowers in one place. The new shoots emerge from dormant bulbs after the first good autumn rains and will usually stay active until early summer (November in the Southern Hemisphere) but will go prematurely dormant if water becomes limiting. The flowers usually appear more than one at a time and when flowering en masse are spectacular. Each flower has five petals which flare like a trumpet during the day and furl at night or on overcast days. Flowers are usually pinky mauve to lilac and can be very dark and intensely coloured or very pale. Other less common colour forms include salmon, peach and pure white (albino). Flowers always have a yellow throat. Flowers start to appear from early winter (May in the Southern Hemisphere) and will usually keep flowering until the plants go dormant. The fruit is small (size of a match head) and contains many tiny seeds which are dispersed by explosive dehiscence. This is a common but undervalued South African native plant, in some cases considered an invasive weed. However, Oxalis purpurea can make a most magnificent garden plant that flowers for half the year if placed in the right spot and kept under control. I love my oxalis. I read they are edible.